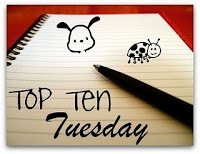 Top Ten Tuesday is a weekly meme hosted over at The Broke and the Bookish. Each week, we get a theme to list our top tens. Well, I simply move on to another book, if I am unable to read a book. Never thought of lying about that. It's a pity that I couldn't even lie about Ulysses by James Joyce, which I couldn't go beyond 4 pages. Or Mrs Dalloway by Virginia Woolf. Saying that I read them can do wonders for my prestige but do I need that? I'm not really into lying about books either. Most of the time I'm not afraid to admit liking/disliking/not reading a book. I'm the same. In my post you can see that I don't really lie about books, sometimes it's just not worth mentioning that I didn't read or like them though. I also don't see the need to lie about reading a book. If I do lie about a book its to spare someone's feelings. Has anyone ever gotten through Ulysses? I own a copy of Ulysses, but I haven't read it. I don't lie about book either. sadly . . . I plowed through Mrs. Dalloway. I don't find any reason to lie about books either. Way to keep it honest. :) I don't really fib anymore nowadays because like you if I'm not enjoying a book, I just stop reading it. And if it's a "prestigious book" why lie about it? It's nice just to be honest about what you've read/not read/liked/disliked. Happy reading! Hmmm, yeah, I don't think I've ever lied about a book but I know I've been probably too honest about books. Woops! Ulysses is on my list. I really liked Mrs. Dalloway when I finally made it through. I wish I could move onto another book, but I'm so OCD. I've only not finished two books before and that was for content reasons. I need to be more like you! Thanks for stopping by my blog earlier. Great post - and also a really great blog you have :-) I am a new follower and will def stop by often! I don't really understand why people lie about reading books.